Re-naming and Re-dedication to public service. Fishguard’s Motor Lifeboat – Presentation, Dedication and Christening. 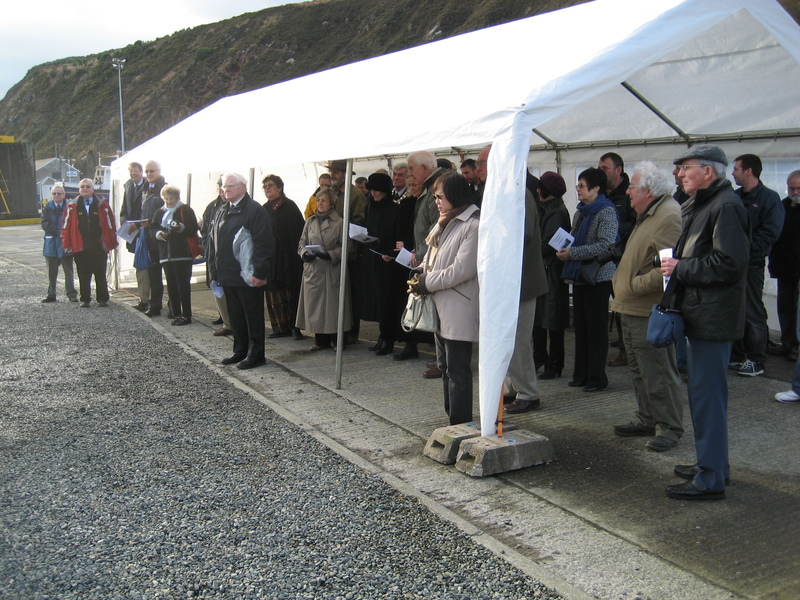 The triple ceremony of presentation, dedication and christening in connection with Fishguard’s new motor lifeboat “Charterhouse” took place on Wednesday afternoon of last week in the presence of a very large and representative gathering, embracing the elite of the locality. The Rev. Gerald Henry Rendall, M.A., Litt.D., LID., Headmaster of Charterhouse School, the past and present scholars of which are the donors of the boat arrived by the afternoon Irish Express, being accompanied by Mrs. Rendall, the Rev. G. S Davies (Master of Charterhouse), and Mrs. Davies, together with half-a-dozen of the scholars, and were welcomed on the platform by Mr. Walter J. Vaughan (the local Hon. secretary) and other gentlemen. The double ceremony of re-naming and re-dedication to public service of the 1909 Fishguard Lifeboat ‘Charterhouse’ took place on Tuesday 15th December in the presence of a representative gathering embracing the ‘elite’ of the locality. Tony Anstee, Jeffrey Matthews and Christopher Walmsley representing the Charterhouse [Old Carthusians] arrived by the afternoon Irish Express. 100 years to the date and time! The Mayor, Deputy Mayor & Deputy Mayoress. Charterhouse Returns Committee:- Chairman Richard Davies, Vice-Chairman Gwilym Price, Secretary Bob Wheatley, Treasurer Chris Williams, Robert Rees, Philip Rees, John Butler, Dr. David Davies, Mike Iles, Richard Goswell, Coxswain Paul Butler, Philip Davies, Steve Done and Jay Morrell. Christine Davies, Jac Williams, Suzie Ferguson, Judy Brundan, Steve Phillips, Roger Strawbridge, Johnny Morris and W.J. [Billy] Davies. 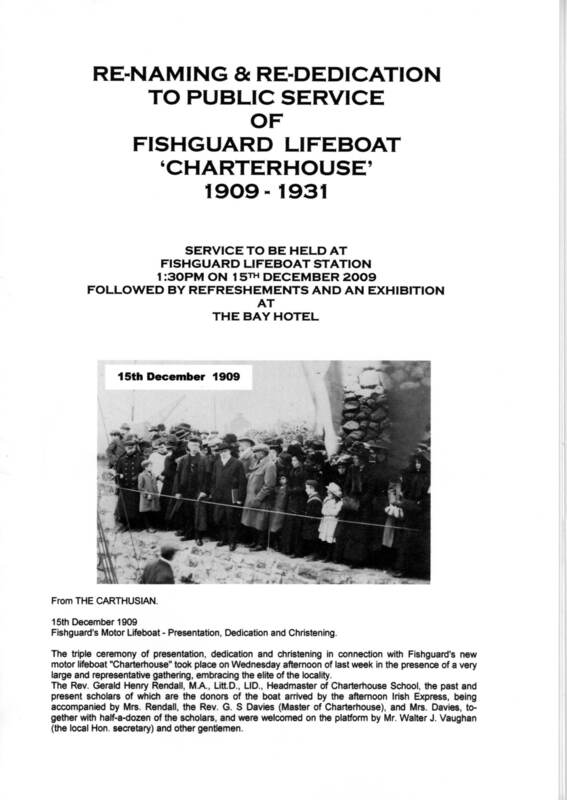 Charterhouse served as Fishguard’s lifeboat from 1909 to 1931 having being donated by Charterhouse School. In 1920 Charterhouse was involved in the famous Hermina rescue. The RNLI awarded 1 Gold Medal, 3 Silver Medals, and 9 Bronze medals to the crew. In 1931 it was de-commissioned by the RNLI and was converted to a private yacht called Marian. It was acquired by the Lomas Family in 1946 and four generations of the family have sailed in her. On 23rd June 2009 the Lomas Family took the Marian to sea with their friends and Phil Davies, and on the return the Charterhouse was lifted onto Paul Morgan’s transporter [Dinas] for the 155 mile journey to Fishguard. The official welcome for the Charterhouse’s return was on the 24th June 2009. The Press reported the event, as did the TV. This means that Phil Davies was the last ‘Fishguardian’ to go to sea on the Charterhouse and perhaps the only ‘Fishguardian’ to sail on her since 1931! Today 15th December, Tony Anstee from the Old Carthusians re-named the Marian – The Charterhouse, and unveiled her new name and Jeffrey Matthews broke champagne over the bows. 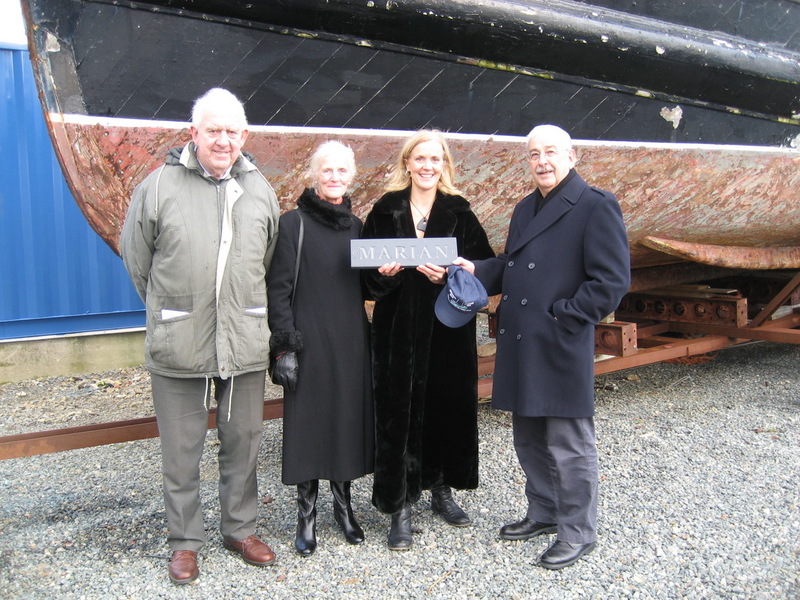 The Deputy Mayor, Bob Wheatley presented the Judith Lomas with a name-plate for Marian [completed by Coxswain Gray RNLI of St. Davids]. Speeches by Richard Davies [Chairman of Charterhouse Returns] by Judith Lomas and Tony Anstee indicated the value, emotion and interest in the project. It was putting the Charterhouse rescue of Hermina in perspective! The Charterhouse rescue was in the dark and was rowed and sailed when the engine failed. How did they cope? A buffet was laid on by the staff of the Bay Hotel, and the staff were so helpful in setting up the exhibition. Speeches by Tony Anstee resulted in two cheques being presented to Restoration Fund with a promise of more to come. Richard Davies thanked all who had made this day so rewarding and emotional. Order of Service by Phil Davies. Neil Lomas, Anne Lomas, Judith Lomas & Phil Davies. On the 12th October Neil and Anne visited the Charterhouse Returns Committee at The Pendre Inn. The Charterhouse original wheel, original Jib [sail] and the original ON 563 brass plate was presented to Richard Davies [Chairman]. The following morning they were guests at the Fishguard Lifeboat Station where Steve Done, Philip Rees, David Davies and Coxswain Paul Butler showed the new station and took them on board Blue Peter! Two members of the Old Carthusians visited the Charterhouse Lifeboat on Thursday. The arrived by train as their party of 1909 did! Chris Williams [Committee Member] – Tony Anstee [Old Carthusian] – Jeffrey Matthews [Old Carthusian] – Phil Rees [Committee Member] with the Needle Rock ‘dead astern’!!!!!!!!! Charterhouse was towed [by tractor] to her permanent berth next to the RNLI Fishguard Station on Thursday by Mike Iles and Chris Williams of Goodwick Marine http://www.goodwickmarine.co.uk/ and Phil Rees and myself. All four are members of the Charterhouse Returns Committee. It is here that she will remain for restoration [with STENA’s compliments]. The position is 100 feet from her original  lifeboat station and slipway. The harbour was extended in the intervening 100 years as a result the original slipway would be 100 feet from the sea. All passengers on the Rosslare Ferry will be able to view it as they dock at Fishguard from the afterdeck of the ferry or when leaving for Rosslare. Charterhouse is so large that it can be seen from the Marine Walk at Fishguard! Phil Rees on board the Charterhouse with Needle Rock astern. Looking at the store-shed – on the position of the 1909 Lifeboat Station. The Fishguard Lifeboat Station with the Blue Peter Lifeboat and Charterhouse. The Rosslare Ferry gives a good view of the Charterhouse from the afterdeck. The Charterhouse and Fishguard Lifeboat Station alongside the quay and visiting craft.